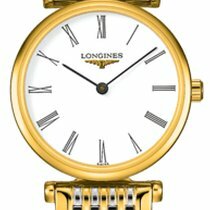 New/unworn Longines HydroConquest Steel & Rose Gold PVD Quartz 300M L37403587. 41mm Stainless steel case. Black dial with Rose gold-tone hands and index hour markers. Arabic numerals mark the 6, 9 and 12 o'clock positions. minute markers around the outer rim. Luminescent hands and markers. Date display at the 3 o'clock position. Uni-directional rotating Rose gold pvd bezel .Quartz movement. Scratch resistant sapphire crystal. Screw down crown. Solid case back. Steel and Rose gold PVD stainless steel bracelet with a Fold over safety release clasp. Water resistant at 300 meters / 1000 feet. 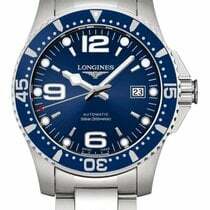 E.U Box and Full Longines Warranty Papers dated 2019. Please feel free to email with any question and check out our Chrono24 history & reviews plus over 300 Trustpilot reviews on our website. We can provide any assurances you may require.